Kasumi - a magical shojo manga! Check out our uber cool fan art submissions that we had received. Kasumi Bishonen Fanart Contest Starts Now on Facebook! 1. Submit 1 fanart of any or all of the bishonen boys in Kasumi by uploading/sharing picture on Kasumi fanpage here in Facebook. 5. Voting by fans on fanpage begins 1 week after contest ends. 8. Winners’ art will also be posted on Kasumi manga website. Facebook - Want to add us as a friend? Check out my Facebook page or search for Surt Lim and Sugimoto-san's page (Hirofumi Sugimoto) and add us as your friends. You can also add your fanart on my page or at the Kasumi Fanpage for all our fans to see! New Fan Art! - We have been receiving more and more fan art. So, check out our fan page for all the wonderful and beautiful art pieces we've received from all our great fans! Blog updates - It's been a while...check out our blog for new updates. More Kasumi reviews! - Want to hear what others think of Kasumi, vol1 & vol2? Check out the following review & blog sites: Kuriousity, Yamiro, LifeAnimeWhatever & AnimeNewsNetwork. Just posted! Kasumi FanArt page! Release date: March 24, 2009. Check out Barnes & Noble, Borders or Amazon and buy a copy! 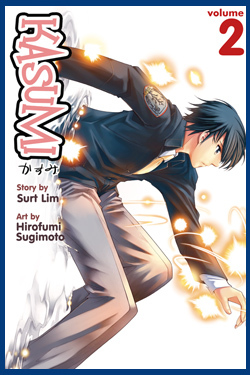 Kasumi, vol.2 reviews - check out About.com:manga, for a detailed review of Kasumi, vol.2. 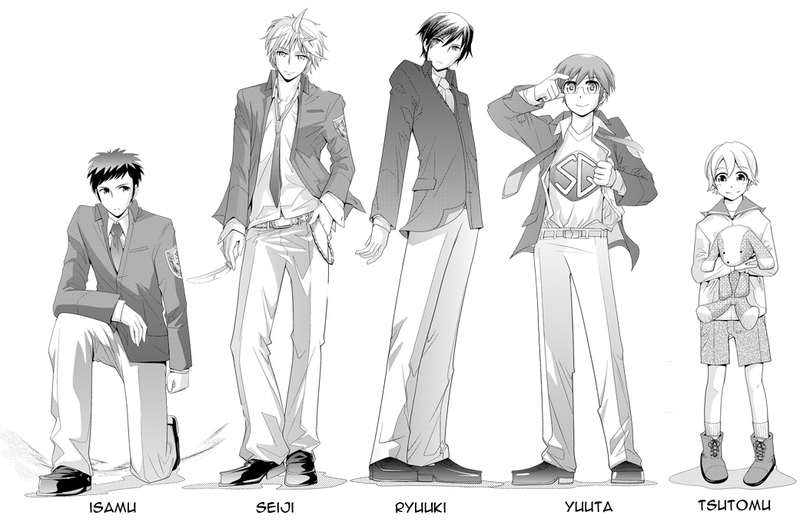 Kasumi's hottest guys ! 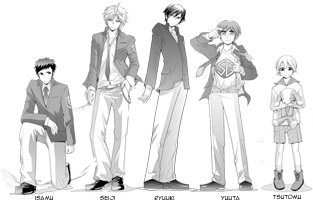 Check out who are the top picks for the hottest guys in Seiran. added sneak peek pages of vol.2! Great news! Kasumi, vol.2 is coming out on March 24, 2009. You can preorder now on Amazon at a discount or you can go to our shop tab to order. Be one of the first to read vol.2! Check out the promos on Kasumi at the NY Anime Festival! Reviews! So, wanna to know what others think of Kasumi? Check out Kasumi's, vol.1 review at San Francisco Bay Area's popular newspaper - Contra Costa Times on July 27, 2008. 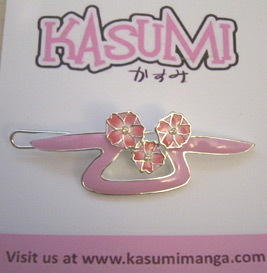 Pick the magic chip and win an exclusive, limited, "one-of-a-kind" Kasumi Sakura hair clip like the one that Kasumi wears below! 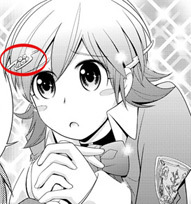 Here's a picture of the actual silver plated hairclip. It's customed design is sure to make any hair "super kawaii"! A wonderful collector's item. Only 500 pieces exist in this world!! Valued at $15.00, it's a prize that anyone would wanna grab! So don't wait! Be one of the very special few to own one! a copy today! You can also purchase Kasumi on Amazon.com, Target.com or right from the source at our publisher - Del Rey Manga! Kasumi Vol.1 Preview! 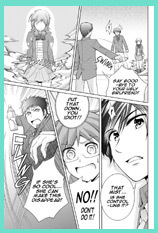 Here're some sneak peek pictures of Kasumi at About.com: Manga. Great News! Our very first Kasumi interview! Wanna know how Kasumi came about? 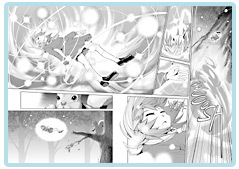 Check out About.com:Manga on July 13th and get to know us better! Check them out! New characters have been added to our "characters" page. Wanna know more Kasumi's new found friends and enemies and what makes them tick? New updates on Sneak Peek! Wanna know more about "Creating a character"? Go check out our Part I on "What's in a name" and get some insights into the meanings behind the names of Kasumi's main characters. Check out Del Rey Manga's Kasumi Contest! Be among the first to read Kasumi! 10 lucky winners stand the chance to get their hands of Kasumi, vol.1. Just email delreymanga@randomhouse.com by June 11,2008 to be part of the randomlucky draw! Great news! Kasumi's release date has been moved forward to July 22, 2008! Preorder early and get a discount on Amazon! Or drop by Barnes and Nobles or Borders and pick up your copy on July 22! Just in! Kasumi collectibles for sale! We've just launched our Kasumi Manga cafe press store. Check out our items in our shop or at www.cafepress.com/kasumimanga. Check out the new updates in Characters and Sneak Peek! And while you're here, feel free to drop by our blog and add a comment or two! Kasumi vol.1 is available for pre-order on Del Rey Manga, Amazon and Target. Kasumi's expected release date is August 26, 2008! Del Rey Manga Newsletter - 2008 Manga Releases by Del Rey. Manga at NY Anime Festival. 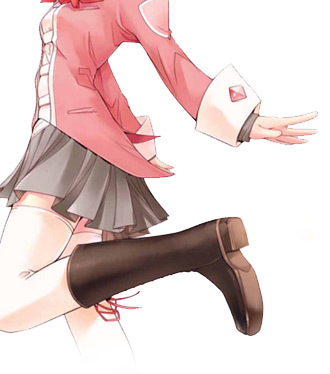 Kasumi Volume 1 will be published in August 2008!